• The government wasted up to £20 billion pounds in a failed scheme to update London’s Underground system. • Tens of thousands of single mothers were left in poverty without financial support from absent fathers. • Tony Blair committed the NHS to the biggest civilian IT project the world has ever seen, despite knowing next to nothing about computing. • The Assets Recovery Agency cost far more to run than it ever clawed back from the proceeds of organised crime. • The Coalition government is at least as blunder-prone as any of its predecessors. Groupthink, constantly rotating ministers and a weak parliament all contribute to wasted billions and illogical policy. But, it doesn’t have to be this way. 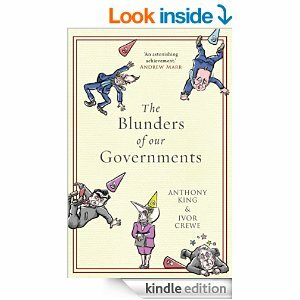 Informed by years of research and interviews with senior cabinet ministers and civil servants, this razor-sharp diagnosis of flawed government is required reading for every UK citizen. With its spirited prescriptions for more fool-proof policymaking, it will prove to be one of the most important political books of the decade. The summary above captures neatly this frightening analysis of government failings down the years: the poll tax, Child Support Agency, NHS IT, the Dangerous Dogs Act. Each blunder is examined in detail and, although all are awful, there is recognition of governments’ potential to do good. Interestingly, many of the reasons for failure could apply equally in a university context too. A really outstanding, scary but ultimately optimistic text and a compelling read.